Painter. Born in London, England on February 2, 1848. At age three Yelland immigrated with his family to New York City where he was raised and attended public schools. By age twelve he had settled on an art career. He was born Raymond Dabb, but due to the negative connotation of the name, added his mother's maiden name, Yelland. After serving under Sheridan in the Federal Army during the Civil War, he attended Pennington Seminary in New Jersey. He studied art at the National Academy of Design from 1869-71 with Page and Brevoort, and then continued at that school as an instructor for one year. With his new bride, he sailed around the Horn to California in 1874 to teach art at Mills College in Oakland. He made a trip to England in 1877 and had further study in Paris with Luc Oliver Merson. Upon his return, Yelland became assistant director of the San Francisco School of Design and in 1888 assumed directorship. While at that school, he also taught at University of California, Berkeley for many years. His many pupils include Homer Davenport, Alexander Harrison, Maynard Dixon, and other noted artists. At his summer home on the Monterey Peninsula, he painted many coastals; whereas, the marshes near his home in Oakland also provided ample subject matter. 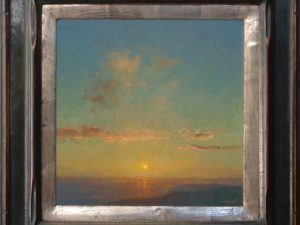 A master at depicting sunsets and atmospheric glow, his painting technique was a fusion of American Luminism and the Husdon River school. Yelland maintained a studio in San Francisco at 430 Pine Street until his death of pneumonia at his home in East Oakland at 1464 7th Avenue on July 27, 1900. Exhibitions: San Francisco Art Association, 1874-1900; Paris Salon, 1877; Mechanic's Institute, San Francisco, 1875-97; California State Fair, 1879-1901; National Academy of Design, 1880's; World's Columbian Exposition, Chicago, 1893; California Midwinter International Exposition, 1894; Oakland Industrial Exposition, 1896; Alaska-Yukon Exposition, Seattle, 1909. Work is included in: Santa Cruz City Museum; Monterey Peninsula Museum; Oakland Museum; Bancroft Library, UC Berkeley; First Congregational Church, Oakland; California Historical Society. Yesterday's Artists on the Monterey Peninsula; Benezit; History and Ideals of American Art; Art in California; Artists of the American West; California Historical Society; American Art Annual 1900.